Seraphinite is named after the Seraphim, the many-winged, fiery angelic beings described in the Bible. 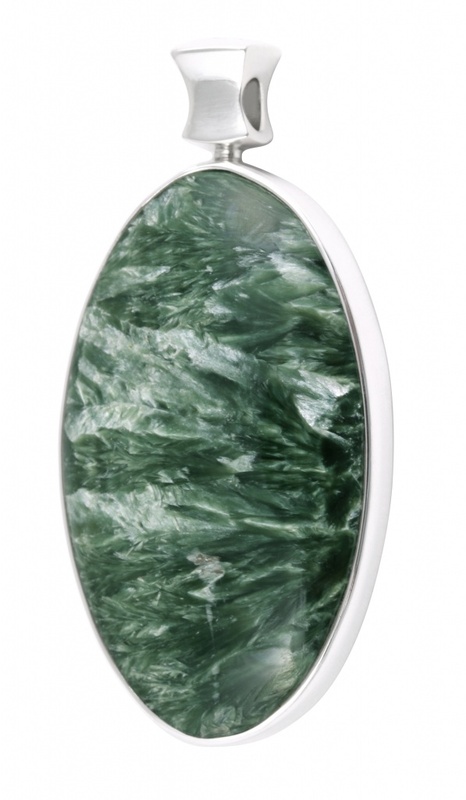 One of the greatest of all the healing stones, it is beautiful and sublime, its cool dark green depths revealing intriguing flashes of silver light. Read on to learn more. Chemical Composition: (Mg,Fe,Al)6(Si,Al)4 O10(OH)8 – Magnesium Iron Aluminum Silicate Hydroxide. 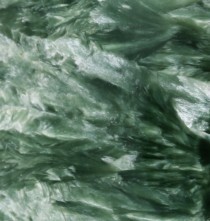 Seraphinite is a silicate belonging to the Chlorite class of minerals, and contains inclusions of silver coloured mica. It was discovered in the 19th Century in Russia, and is known in geological circles as Clinochlore (from the Greek words, “Clino”, meaning “incline” – referring to its monoclinic crystal system – and “chloros”, meaning “green”). Seraphinite forms when iron and magnesium silicate minerals go through the process of either metamorphic or hydrothermal change, or a combination of both. High temperature or pressure can cause existing minerals to change form and recrystallize, a phenomenon known as metamorphism. Alternatively, the flow of mineral-rich hot water (hydrothermal activity) can result in a build-up of minerals in solution that, upon cooling, will crystallize. Though shades of brown, white and even yellow and red have been known to occur, seraphinite is generally found in shades of dark and light green, interspersed with flecks of silver. These silvery flecks are in fact inclusions of mica, and it is common for these inclusions to resemble many feathery silver wings. It is partly this phenomenon that inspired seraphinite’s name, in deference to the angelic seraphim. 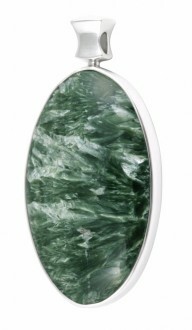 Seraphinite is considered as one of the most exalted healing stones on Earth for this age. Chlorite, even as an inclusion in other minerals, has always been prized for its healing properties, but even more so in this form. Healers believe that seraphinite is the most effective stone for cellular regeneration, as well as clearing the body and blood of toxins. As such, it has a positive impact on the health of both liver and kidneys. Even disease and illness relating to past lives may be addressed by seraphinite. It is attributed with bringing relief from colds, and also with promoting effective weight loss. The powerful healing qualities of seraphinite extend to emotional and mental healing as well. 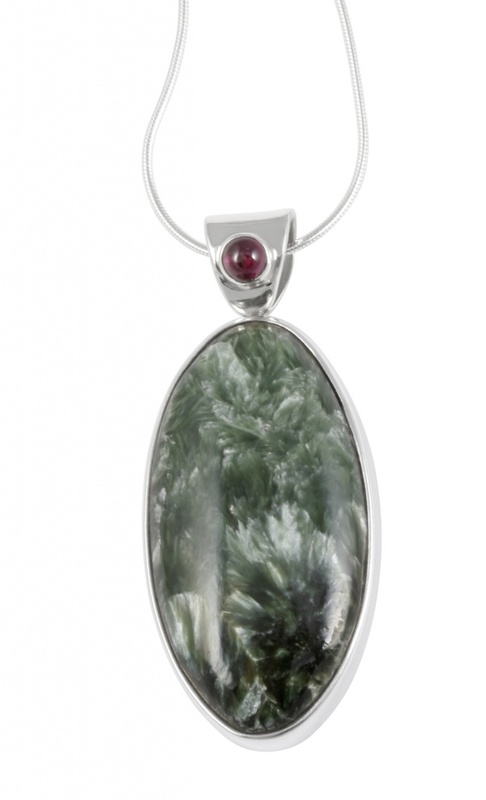 Seraphinite plays a double role in both helping us to be centred in, and energizing our chakras. Though its green colour suggests it is particularly suited to heart chakra work, it is by no means limited to the heart, and it is said that placing seraphinite on the crown will bring about the alignment of all the chakras. Seraphinite provides strong protection for the heart whilst promoting centeredness, and provides the energy to release old emotional patterns whilst either establishing or coping with new ones. It helps create order and wholeness where once there was disarray. For those on the Spiritual path, this highly evolved stone prepares a supportive environment for ones own spiritual evolution. It is said to link the physical realm with the highest angelic realms and to realign ones physical body with ones’ higher will and purpose. 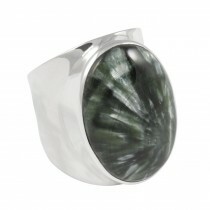 Its energy is described as clearly feminine, and helps to sharpen ones intuition and awareness. It is also used as a tool of manifestation and transformation. Seraphinite relates to the astrological sign of Taurus, and the elements of Air and Earth.